Angle Iron lockers are built within a 1”x 1” x 1/8” angle iron frame. The 1/8” thick angle iron exoskeleton creates extra strong locker edges and provides a solid framework. Equipped with diamond perforated doors and sides, this locker offers a high degree of air flow. 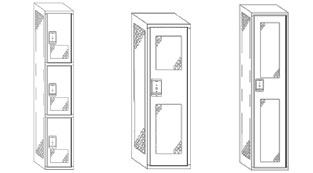 All Angle Iron lockers are built with the top (16 Gauge), bottom (16 Gauge) and back (18 Gauge) panels spanning multiple lockers, reducing seams and adds rigidity and strength. These lockers are available in 1, 2 & 6 tier. Locker Groupings: The unit growth factor of the Angle Iron locker is not the same as the All Welded Plus locker due to its one of a kind construction. The intermediate vertical door frame channels are all common between openings in the Angle Iron locker. The hinge of one door is welded to the left side channel and the latch of the right door is welded to the other side.